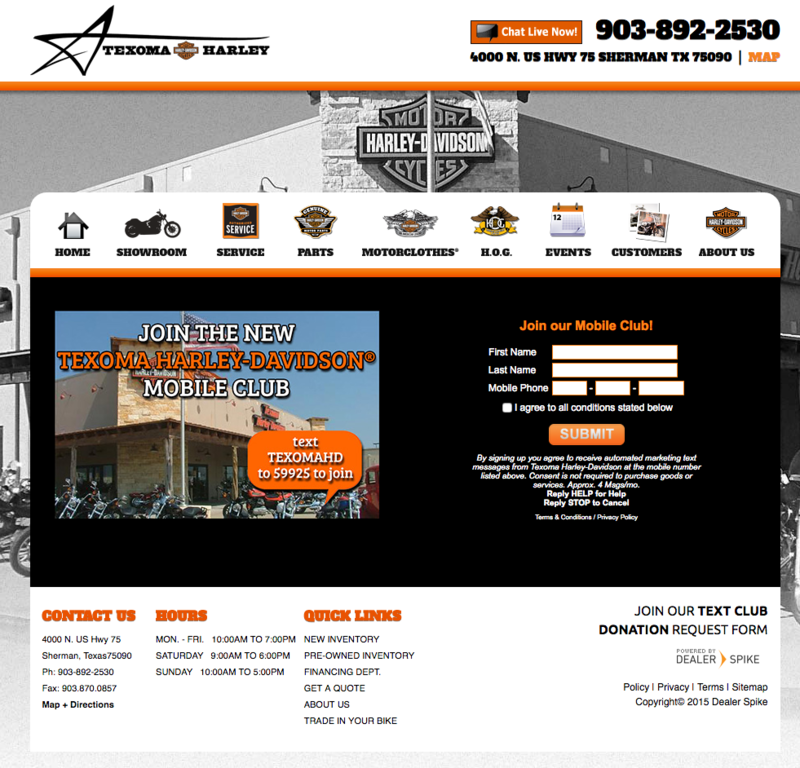 OBJECTIVE: Each of Adam Smith's Harley-Davidson dealerships wanted to increase the size of their respective mobile databases to better communicate and engage with customers. In recent years customers have expressed a desire for more communication and offers via mobile. Calculated Risk Marketing Director, Sarah Oakley, said, "We knew the value in text message marketing - this is the way our consumers have told us they like to hear from us. Actually, our riders were demanding that we send them more messages so they wouldn't miss out on stuff...when was the last time you heard a consumer ASK for more messaging?!". The dealerships wanted to find an affordable way to communicate to the growing group of loyal customers and deliver more effective responses and engagement from those customers. STRATEGY: Having used 3 mobile platforms previously the Adam Smith's dealerships never had the opportunity to reach their existing customers in their dealer management system via mobile. Oakley said, "Our old platforms were very limited to what we could do and how we did it. It wasn't mobile marketing...it was a message board.". Utilizing the data import feature of the 7 Media Group proprietary mobile platform allowed the dealers to immediately invite those existing customers to join the NEW mobile club. 7 Media Group's system capability of validating phone numbers as mobile or landline also gave the dealerships a better understanding of how mobile-friendly their customer base truly was before creating their overall mobile plan. In addition to the data import feature the dealers were also given a short code, keywords and online sign-up widget to place on their website. On each dealers website they also added a graphic button or call to action to "Join Our VIP Mobile Club" that directed customers to an online web form created by 7 Media Group. This web form was tied directly to each dealers mobile account and as a customer entered information then submitted they received an immediate mobile response via text to confirm their sign up. RESULTS: In just under 30 days the 5 dealers were able to increase the size of their mobile databases by 190%. Oakley Said, "The growth was incredible. The ability to "invite" our customers from our DMS was one of the features that intrigued me the most to start with. We have all the information...and no other system would let us use it! If the invitation worked as 7 Media Group promised, I knew we'd see a lot of responses. But I'll be honest and say that I didn't think it would work quite as easily as it did. I was very skeptical going into this partnership b/c I have been promised the moon from other mobile companies with nothing more than a let-down. But 7 Media Group exceeded our expectations and over delivered in every area. And they put up with my 100 questions and weeks of back-and-forth for more details before finally committing!". 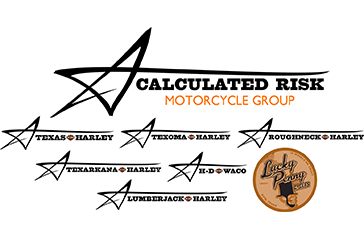 This immediate increase in customer opt ins gave the dealers an incredible opportunity to now communicate with 1000's of customers in real time for events, dealer updates, bike runs and much more. With the 7 Media Group mobile system they were even able to communicate with customers one to one when customers had questions or needed additional information on inventory, event details, etc... Oakley said, "I love that I can see our rider's responses to messages...AND reply back individually to help them. This type of personalization gives us a leg up on our competitors. 7 Media Group's system allows us to set up service reminders and schedule pick ups - this provides incredible convenience for our riders. The platform is easy to use and it's continuously evolving to keep up with the market trends.". Working with 7 Media Group has been "Fast. Easy. Helpful. I don't even know how they do it! I can't even respond to my work emails/texts as fast as they do! Top notch customer service." "We are so excited to start using the target lists and the service reminder features. These functions are going to be huge for us. We see the trend of our email open rate going down, so the importance of text is huge. Don't get me wrong - we still send emails...but this platform will give us more flexibility, better targeted messages, and see better results with little "waste"." 7 Media Group is equipped to completely manage your mobile solution. Our system is a full opt in/opt out format to easily provide two-way communication between you and your audience. 7 Media Group offers a robust platform that can accommodate virtually any SMS campaign requirement as well as mobile web, mobile kiosks, mobile application development and more. We can help you create a mobile alert loyalty club so you can better communicate with your customers almost overnight.